The GHost Formula, is part of the exhibition, No Such Thing As Gravity, at the National Taiwan Museum of Fine Art, Taiwan from April 22 – June 25 2017. Based on a neuroscience experiment, it attempts to induce FoP (Feeling of Presence). Robot fabrication by Sarah Angliss. Sparkes will be undertaking a residency funded by the NTMoFA, in the weeks running up to the exhibition. During this time she will be researching ghost culture in Taiwan and presenting this information on her website the GHost Portal. Artifacts, used in Taiwan ghost rituals, will be added to her installation in the museum. British Council is pleased to support ‘No Such Thing As Gravity’ – an exhibition showcasing arts and creative technology presented by UK’s leading media art centre – Foundation for Art and Creative Technology (FACT) in Liverpool and National Taiwan Museum of Fine Arts (NTMoFA), the leading museum for digital arts and creativity in Taichung. Curated by Professor Mike Stubbs, artistic director of FACT and Dr. Rob La Frenais, guest curator from the UK, the exhibition attempts to explore the unknown areas and controversial issues in science through the lenses of artists and creative technologists. 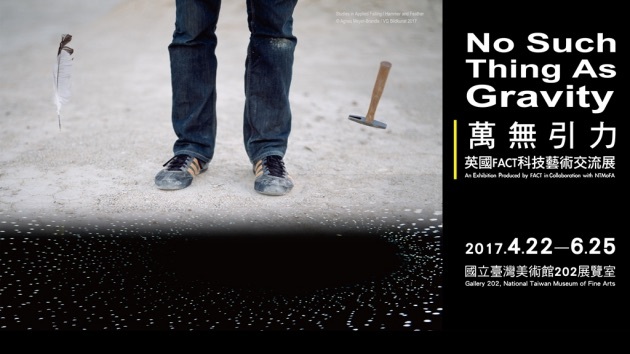 Hosted at National Taiwan Museum of Fine Arts from April 22 to June 25, the exhibition will show to audience the trend of cross-disciplinary collaboration between contemporary art and science, responding to the questions of humanistic and philosophical perspectives in science. In ‘No Such Thing As Gravity’ the artists are from the UK, Germany, Mexico, Taiwan, Australia, and Russia, presenting 14 pieces of art works, including new media, video art, installation, photography and performance. 5 teams of artists are from and working in the UK. Finally, Semiconductor, UK artist duo Ruth Jarman and Joe Gerhardt, make visually and intellectually engaging moving image works, which explore the material nature of our world and how we experience it through the lens of science and technology. They present two films in this exhibition – Worlds in the Making and Magnetic Movie. Worlds in the Making is a moving image work that uses the tools of volcanology to re-interpret the landscapes of our volcanic planet, by translating data collected from volcanoes into audio, evoking images of rocks grinding below the earth, and creating animations of matter forming as mineral crystals. Magnetic Movie shows the experiment on invisible magnetic fields conducted and described by NASA’s Space scientists. Actual VLF (Very low frequency) audio recordings control the evolution of the magnetic fields as they delve into our inaudible surroundings, revealing recurrent ‘whistlers’ produced by fleeting electrons.